Did you know that every scale pattern on the guitar relates to its own chord and arpeggio and that learning these connections is key in mastering the guitar? A lot of guitarists get stuck learning these relationships. I know because at one time in my guitar playing life learning this seemed like an impossible task. So I started my search. I started studying guitar with a couple of good guitar teachers, studied music theory, and basically read everything I could get my hands on, until it all made more sense. After a while I was able to improvise my own solos. Yes, it did feel as great as I dreamed it would be! I became quite good with this and I started figuring out blues and rock songs and solos by ear, until I could improvise my own version of these. I Wanted To Go Further And Deeper – And Learning Arpeggios And Scales That Fit The Chords Was Just What I Needed! But I knew there was something more out there. I wanted to really master the guitar. Some of my solos sounded quite similar to other solos and I knew my phrasing sometimes lacked a kind of melodicness. That was about the time I learned how to solo over the chords in the progression, as opposed to playing one scale over the entire chord progression. So what is the trick in using chord tones to start creating more melodic solos? Every scale pattern on the guitar is related to its own chord and arpeggio. Learning these relationships will increase your options for soloing (note choice) immensely. You will be able to spell out the notes of the underlying chords in your solos. 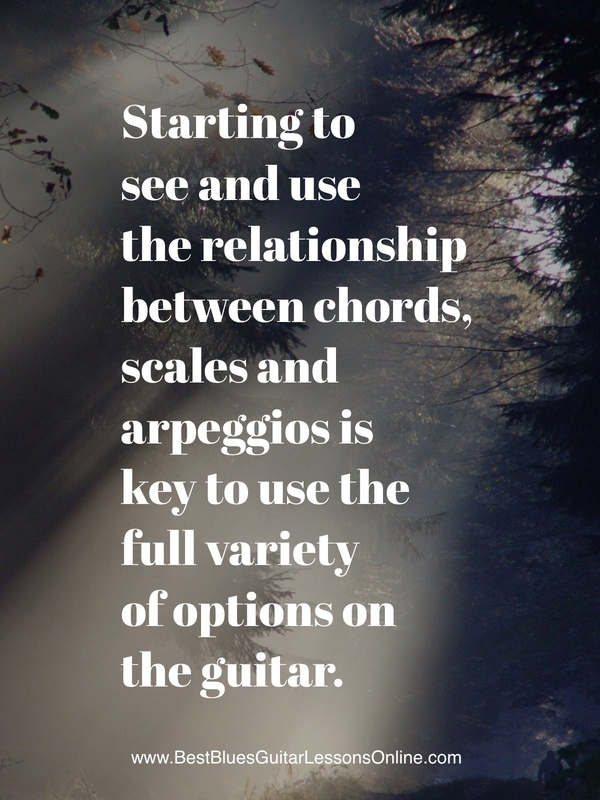 The term arpeggio simply means that we are playing the tones of a chord one by one, not all of the notes at the same time (as you would play if you strum a chord). 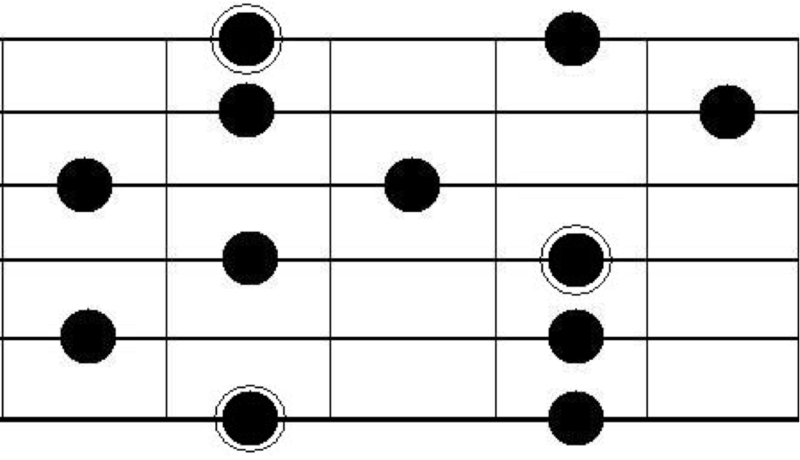 Take note that some of the frets we play when using the arpeggio are not being played on the exact same position in the chord (such as the 4th fret on the A string), but nonetheless these notes are included in the chord as well. 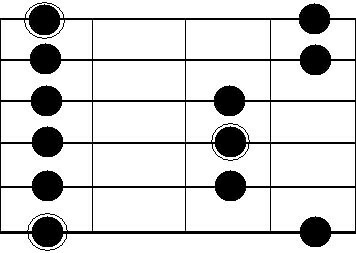 In the example of the 4th fret on the A string we are playing the C# note, which is being played on the G string in the chord. The key here is to make this arpeggio create something musically. This could be accomplished by using one note of the arpeggio and sliding towards that note from the A minor pentatonic. The next lick combines the minor pentatonic with notes of the A7 chord. As you can see, this lick is build around the A7 chord, since it uses notes of the A7 arpeggio. Notice the relationship with the A minor pentatonic scale and how the chord tones of the A7 arpeggio are adding color to the overall feel of the lick. Starting to see and use the relationship between chords, scales and arpeggios is key to use the full variety of options on the guitar. A common starting point that guitar teachers use is getting their students to learn to play the minor pentatonic in all positions on the neck of the guitar and learning the major and minor chords that can be played in each of these positions. From there they focus on learning the arpeggios that go along with these chords and start improvising phrases around these chords. The truth is that I don’t want you to work hard at mastering the guitar. I want to lay all of the pieces of the puzzle in front of you so that you can put the puzzle together without getting frustrated at the difficulty of topics such as arpeggios. I have found that starting to use arpeggios for improvisations can be such a frustrating challenge. That’s why I suggest taking a slightly different route if you are new to arpeggios. A route that will get you to the goal of building melodic solos that spell out the chords in the underlying progression more easily and smoother. As I mentioned, this subject is very broad and can be quite a challenge, which is why I would recommend studying this guide on how to use the best scales to play over blues chords. This guide will show you an even better alternative over using arpeggios to outline chords, since you will learn how to use a scalar approach to play over blues chords. The method I explain there will get you playing the same licks as you would construct using arpeggios, but in a way that’s easier to understand and implement. Since this scalar approach is constructed on the minor pentatonic scale you already know it is easier to get into as well. 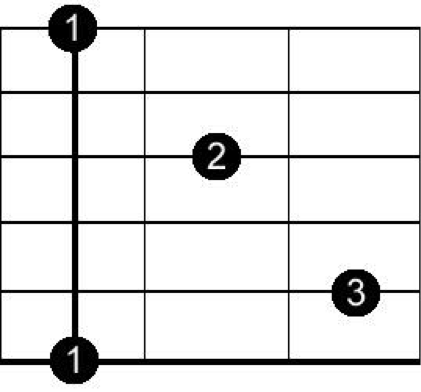 You will find that using a scalar approach (such as using the scale you find below) to solo over blues chords is easier to develop than using arpeggios. Since you probably already know how to use the pentatonic scale, taking the step to use the dominant pentatonic scale isn’t that big of a jump to take, since this dominant pentatonic scale also uses two notes per string. While we are using a total of four different notes in the A7 arpeggio, we are using five different notes in the A Dominant Pentatonic Scale (hence the name ‘pentatonic’, which means ‘five tones’). So the only difference between the two methods is one note. Then why I am suggesting using the scalar approach before delving into playing arpeggios? The answer is simple; if you are used to improvising using the minor pentatonic scale, using the dominant pentatonic scale will be easier. Playing arpeggios can seem like a daunting task. Learning the dominant pentatonic scale gives you a smooth transition between what you already know and the next step in your blues guitar soloing progress. Which route you take is up to you. Some people use arpeggios to outline the chords of the progression they are playing over, some like using the dominant pentatonic scale. In the end, both methods have similar results. I suggest you study the guide so you can determine for yourself. You can download the ‘How To Play The Most Awesome Licks Over Any Blues Chord’ Guide here. In this guide you’ll find exercises to use arpeggios to play over blues chords (referred to as ‘Approach 2A in the guide) and exercises to use the dominant pentatonic scale (referred to as ‘Approach 2B). That way you can make an educated decision for yourself.